The following is a list of the conditions Boxers are predisposed to. It is by no means, a complete list nor does it imply your Boxer will automatically suffer from one or more diseases listed here. You should consult your licensed veterinarian for additional information, treatment and/or medical care. Aortic Stenosis ~ This disease is hereditary and means there is an obstruction below the aortic valve. A veterinarian can diagnose this condition in a variety of ways including x-rays and an ECG. Some dogs require medication. This is a serious condition that can result in sudden death. Dogs who have this condition should never be bred -even if he is a “normal” littermate. Bleeding Disorders ~ Boxers are prone to several bleeding disorders including von Willebrand’s Disease, Factor VII deficiency and Prothrombin disorder. Cancer ~ The overall incidence of cancer is incredibly prevalent in the Boxer dog. Mast-cell tumors, histiocytomas and lymphomas are common. Cushing’s Syndrome/Cushing’s Disease ~ The body produces too much cortisol. In most cases, the condition results from a tumor in the pituitary gland of the brain. It is usually seen in middle-aged to older dogs. Some signs are: increased thirst, hunger and need for urination, hair loss, muscle atrophy and lack of energy. There are several screening tests for Cushing’s Syndrome. Demodicosis ~ Boxers are one of the most common breeds affected by this condition. Demodex mites are on the skin of all dogs; however, some dogs are born with a defective immune system and so generalized demodicosis (mange) becomes an issue. The condition is thought to be genetically transmitted. Dogs with a history of demodicosis or generalized demodicosis should never be bred. Dilated Cardiomyopathy ~ This refers to a defect of the heart muscle. Essentially, the heart is not an effective pump and the dog eventually dies from heart failure. This condition is extremely common in the Boxer. It is believed to be genetic. Routine vet exams are recommended for young and middle-aged adults. There is no cure for cardiomyopathy. Responsible breeders should know the medical history going back at least three generations and should not use dogs in their breeding program who suffer from this condition. Bloat/Gastric Dilation ~ Boxers are particularly prone to bloat. Bloat occurs when air (gas) gets trapped in the stomach and it actually twists. Blood supply to the stomach is cut off. If your dog does not get medical attention immediately at the onset, he will die. Bloat can occur if your Boxer engages in exercise before or after eating and drinking. It also happens when your dog eats too quickly. You can help lessen the chance of this LIFE THREATENING condition, by placing large toys (too big for your dog to pick up or push out of the bowl) in your dog’s food dish, so he has to eat around them, thus slowing down his pace. Breaking up servings and feeding your companion two or three times per day is an appropriate recommendation, as he will not be “starving” and will be less likely to scarf his food down quickly. Never let your Boxer exercise or “rough house” directly before or after meals. Do not let your Boxer gulp down water. It’s best to offer little bits and refill throughout the day. Hip Dysplasia ~ This is a genetically transmitted problem of the hip joint. Dysplastic hips promote degenerative joint disease which can eventually incapacitate the joint. Aspirin, anti-inflammatory drugs and surgery are all options depending on the dog and the severity. Histiocytic Ulcerative Colitis ~ This is a “chronic inflammatory disease of the bowel” that occurs almost exclusively in the Boxer.” It is believed to be genetic in cause. Younger Boxers seem to be affected and develop severe diarrhea. Diagnosis is through a biopsy of the colon. There is no cure and the condition is life-long. 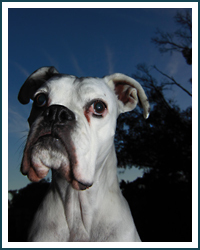 Hypothyroidism ~ This condition is the most commonly diagnosed hormone problem in the Boxer. It refers to an insufficient amount of thyroid hormone being produced. Hypothyroidism can be difficult to diagnose. It is beneficial to run a basic panel evaluation T-4, free T-4, TSH and check cholesterol levels on a regular basis. 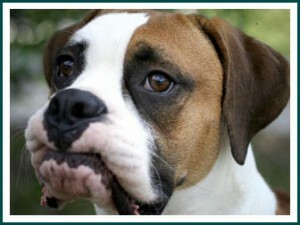 Boxers who suffer from Hypothyroidism should never be used in a breeding program. Refractory Superficial Corneal Ulcers ~ These are ulcers on the surface of the eye. Eyes are usually watery and painful. Surgery is sometimes required to trim away the damaged cornea with antibiotics applied as necessary. In summary, canine parents pass genetic disorders on to their puppies. The only way to lessen the perpetuation of breed-specific disorders is to breed only healthy dogs that have been tested and certified as being free of those genetic problems! Summaries derived from information in Dr. Ackerman’s Book of Boxers © 1996.